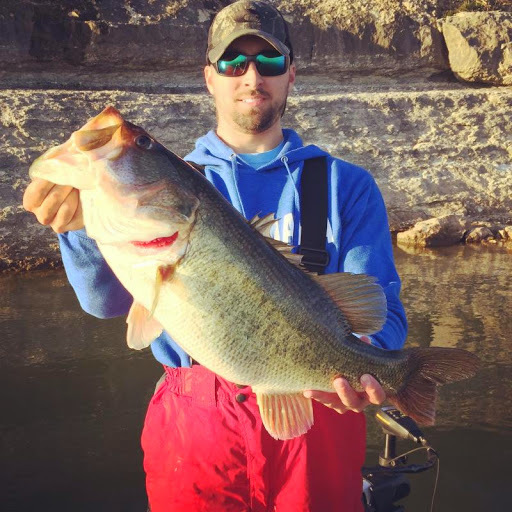 This is Tanner Worley with his 10.52 black bass. He caught this last Wednesday.. the same day we were on the lake last week…. It was caught outside of King Creek on a Picasso Lures Bait Ball School E Rig umbrella rig, with Santone Rig Heads, with Kicker Fish 3.8″ Money Shad Tail Slappers on them. I throw it on a GLoomis NRX Umbrella Rig rod, with a Shimano Curado 5.5:1 with braided line. It came out of 15 foot of water. After I set the hook I thought it might have been a stripper because it started stripping drag and heading for deep water. It didn’t jump or come up until we got it right by the boat and netted it. I caught it last Wednesday, February 11, 2015 around 9am. Our thanks to Tanner for giving us the opportunity to post the info here on Whitney Lake Online! Having fished most of my life and Whitney Lake specifically for 20 years, I know every stump, sand bar, rocky bluff, and sink hole on Whitney, well some of them anyway. I could probably fill a semi-truck with the 5+ pounders caught on this beautiful lake. My job is to report to you on some of the best black bass fishing in the state of Texas.